It’s never easy combining a full-time job with the various smallholding tasks but it’s particularly difficult at this time of year when everything is growing like mad and providing edible produce. Thankfully I haven’t bothered to mention the courgettes this year because the blog readers would be as sick of them as we are at the moment! For some reason, this year our redcurrants have been ignored by the wildlife so we actually managed to get a half decent crop from the 2 bushes. This was our first ever crop of redcurrants because in the past I’ve left them as a sacrificial crop so that the blackcurrants didn’t get taken. 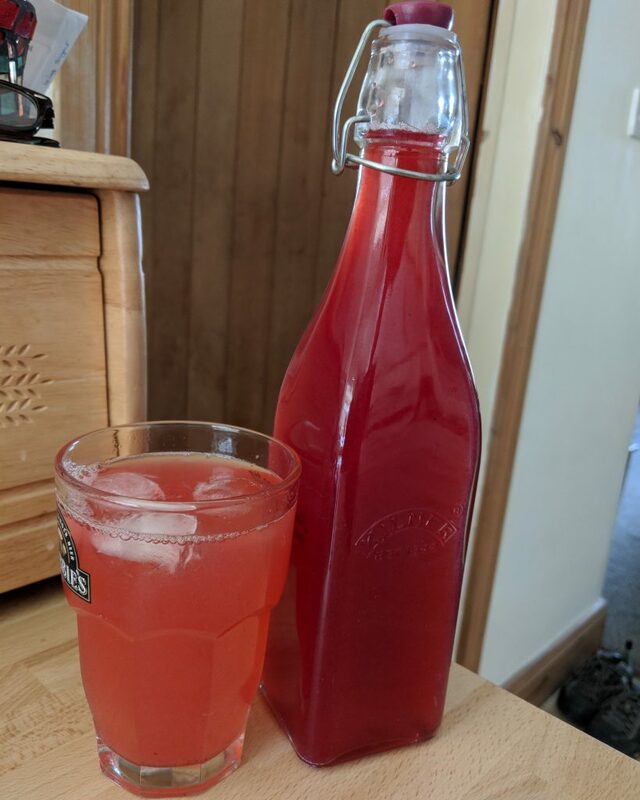 A quick first attempt at a redcurrant cordial proved to be very successful with some of them but the rest have been frozen and will be dealt with when there is more time available. It’s now the turn of the blackcurrants to be harvested and they’ll also end up in the freezer for now but I’d rather that than lose them completely. Next year may be even better as I took 5 or 6 cuttings when pruning the blackcurrants and it looks like most if not all of them have taken very well. That cordial looks good. I can donate 2 cherries to bulk up your 3 blueberries…! !